H x W: 40 in. / 28 in. Cushing's daring plan and its successful execution against the Confederacy's powerful ironclad ram CSS Albemarle in the Roanoke River in October 1864 defined his military career. He also saw action at the Battle of Hampton Roads, Virginia and at Fort Fisher, North Carolina. Cushing gained fame as one of the most daring officers in the Civil War Navy, as he frequently volunteered for the most hazardous missions. His heroism, good luck, and coolness under fire were legendary, bringing him to the attention of President Lincoln. 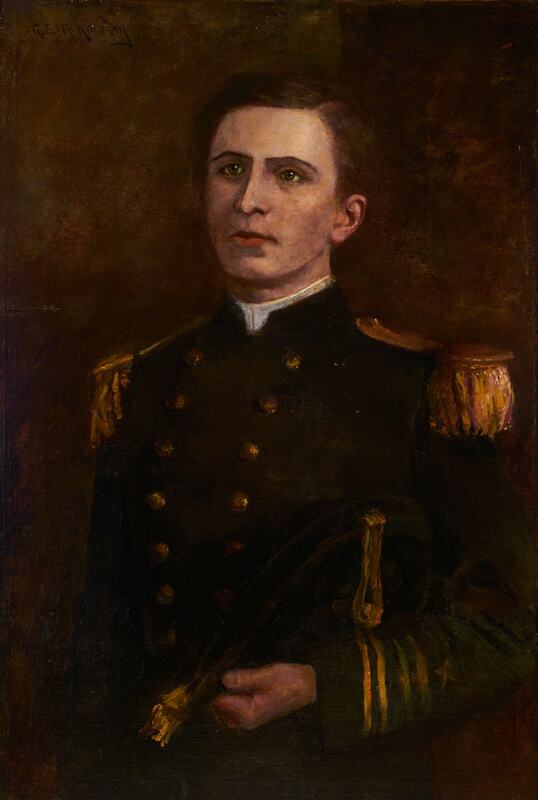 Biographers have called him “Lincoln’s Commando.” In 1874 Cushing assumed the post of Executive Officer of the Washington Navy Yard. Since his death, five U.S. Navy ships have been named after him. His portrait also hangs in Memorial Hall, U. S. Naval Academy.